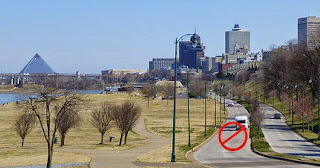 The year-long experiment - to see how well Riverside Drive functions as a 2-lane road and how the addition of a bike and pedestrian path benefits the riverfront and downtown - is underway. From Beale Street south to Carolina, the 2 lanes closest to the River will be closed to cars and open as paths for pedestrians and bikers. The lanes to the east, closest to the Bluff, will be for car traffic. Reworked cuts and crosswalks will permit access to Tom Lee Park and its parking lots. Reducing the number of lanes on a road is a national trend to see if cutting lanes slows-down traffic and makes an area more walkable, bike able, and people-friendly. The cost is minimal, and the change is being monitored to make sure there are no unexpected, ill side effects. Reduce Riverside to 2 lanes of car traffic, 1 on each side of the median. Replace what is now the most eastern car lane (nearest the Bluff) with cheap or free parallel parking to eliminate the need for parking lots in Tom Lee Park. Plant the median with shade trees to form a tree canopy. For Jeff Speck's full riverfront report, click HERE. For more info. and to see the results of "road diets" in other cities, click "Road Diets - Loosing Width and Gaining Respect." For coverage in the Daily News, click HERE.